A new study published in the Proceedings of the National Academy of Sciences (PNAS) from the University of Missouri has succeeded in creating embryos with “heteroplasmy,” or the presence of both maternal and paternal mitochondrial DNA. This new innovation will allow scientists to study treatments for mitochondrial diseases in humans as well as the significance of mitochondrial inheritance for livestock. For their study, Sutovsky and Song identified two separate ubiquitin-binding proteins, called SQSTM1 and valosin-containing proteins (VCP), within embryos they believed were responsible for removing paternal, sperm-contributed mitochondria and their genetic cargo. Sutovsky, Song and their colleagues experimented by inhibiting SQSTM1 and VCP separately, but found that even when one protein was incapacitated, the other protein still carried out the duty of disposing of the paternal mitochondria inside the fertilized egg. However, when Song and Sutovsky inhibited both proteins simultaneously, the paternal mitochondria were not removed and remained within the embryos. 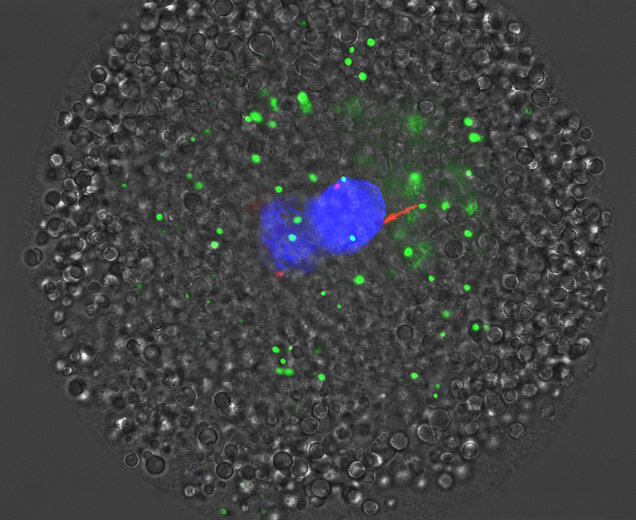 The study, “Autophagy and ubiquitin-proteasome system contribute to sperm mitophagy after mammalian fertilization,” was funded by the National Institute of Food and Agriculture within the U.S. Department of Agriculture. Additional funding was provided by the National Institutes of Health Office of Research Infrastructure Programs, and by the Food for the 21st Century program at the University of Missouri. Stuart Meyers, a professor in the UC-Davis School of Veterinary Medicine, was a co-author on this study.